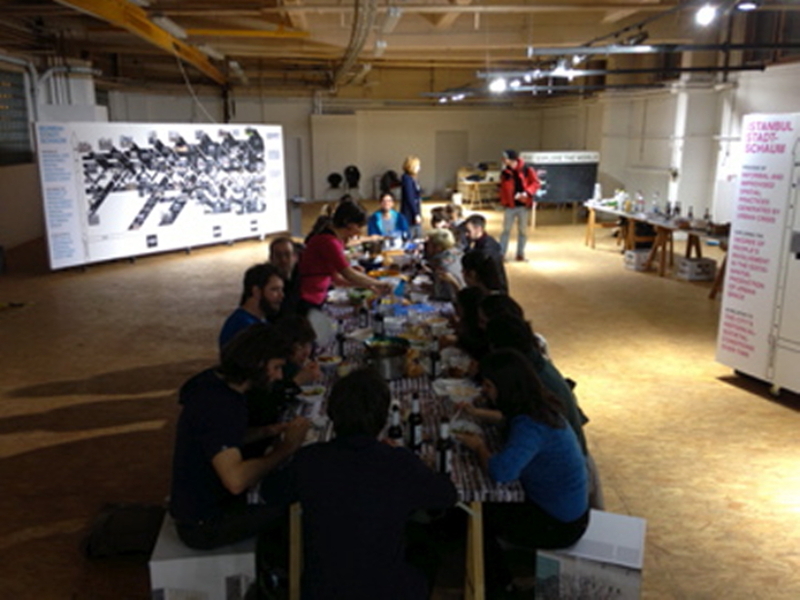 During this event, there will be a commented visit of the STADTSCHAUM exhibition by the curators (Ingrid Sabatier & Stephan Schwarz from ISSSresearch) with the possibility to discuss related issues and questions, followed by a common dinner prepard by Dinner Exchange Berlin at the Alte Zollgarage, Former Airport Tempelhof, Berlin. Free entry to the exhibition. 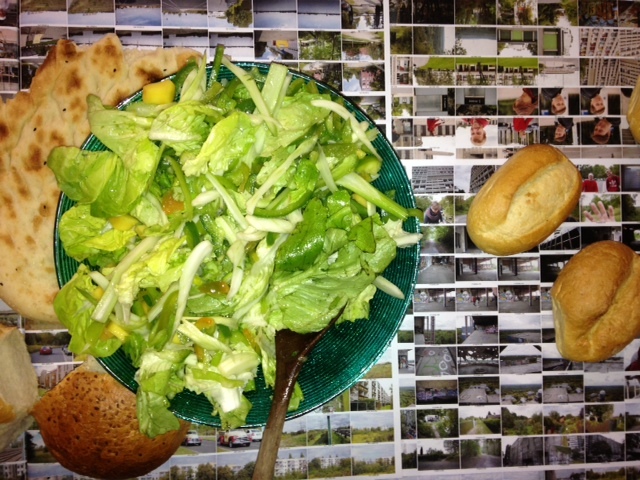 Menü: Blattsalat mit Paprika & Fenchel & Mango; Gurkensalat mit Petersilie; Zwiebel-Auberginen-Paprika-Couscous; frischer Obstsalat mit Minze. 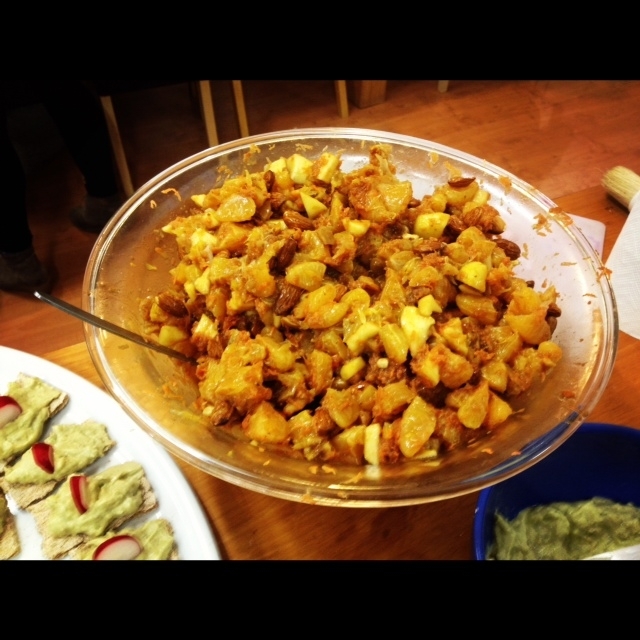 This proved to be quite a popular dish with our guests at the dOCUMENTA (13) dinner. The days of August in Kassel were filled with heat, so we wanted to create something refreshing as a dessert. We were presented with boxes full of tangy apples but no oven (which eliminated all ideas of making anything baked like a tart/crumble etc). 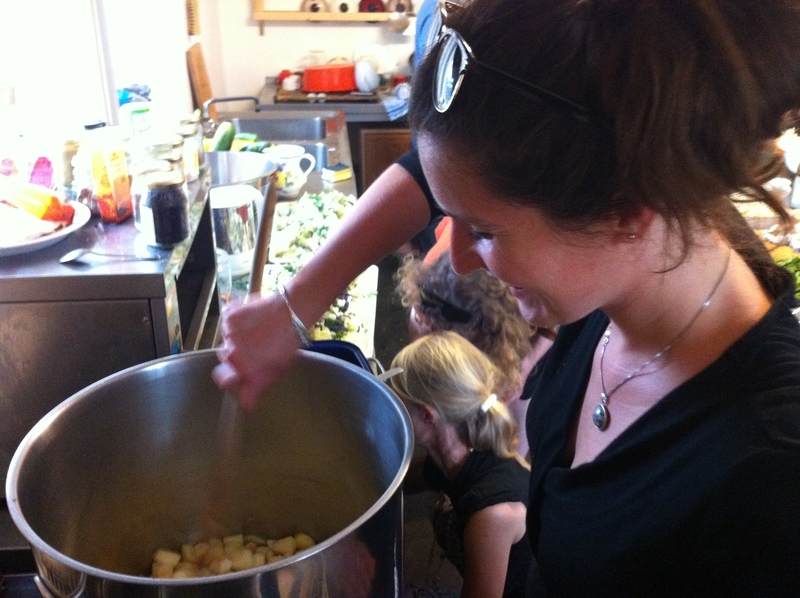 However, we did have a pot huge enough to accommodate the masses of apples. So we made this apple compote. The mint and cinnamon add a real twist and the compote can be enjoyed warm or cold. 5. Take off the stove when the compote tastes like mint and cinnamon and cool. 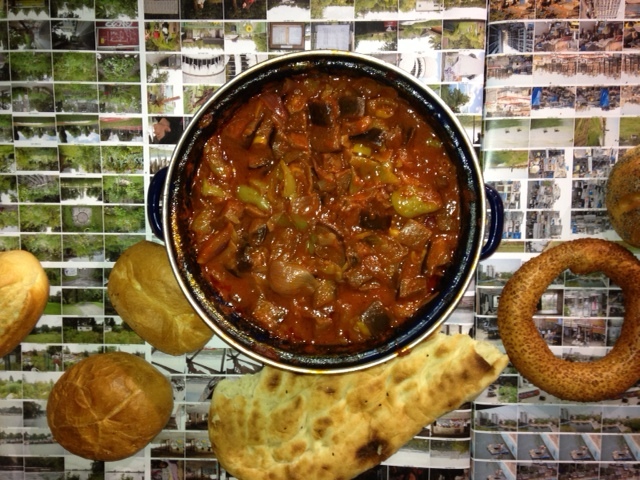 This is one of our favourite recipes. 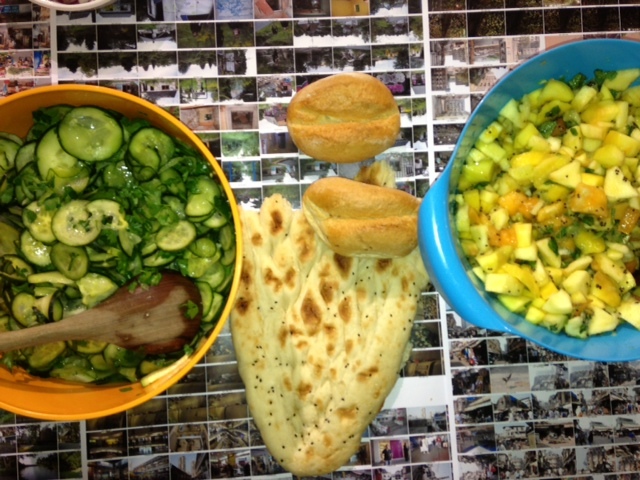 We came up with this whilst cooking for the participants of the venture weekend organised by Climate KIC. Inspired by the Christmas season, we added almonds and figs to this Mediterranean salad. The recipe works just as well in the summer though – it’s simple, fresh and light. Enjoy! Coffee & Cake (a.k.a.) Dinner Exchange Berlin #7, betahaus, 2. 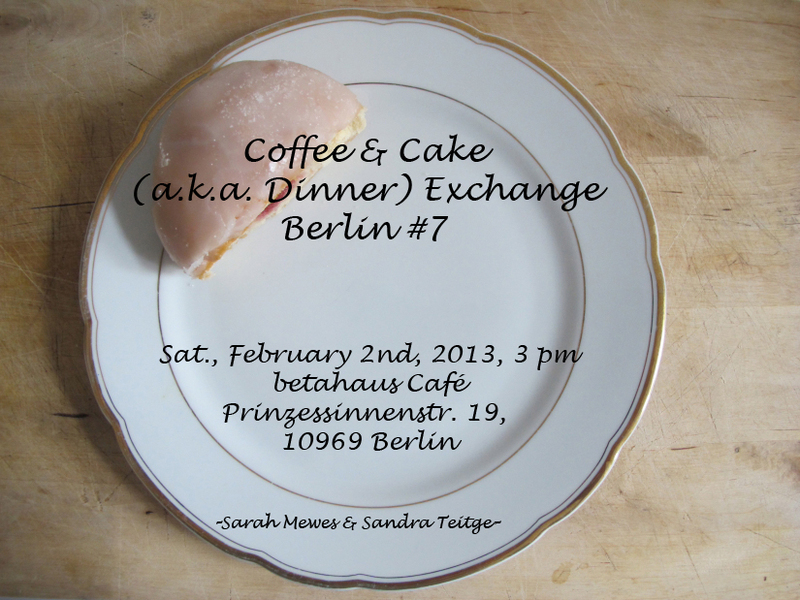 February 2013, 3-6pm If you would like to reserve a place at this event, please email dinnerexchangeberlin@gmail.com. Happy 2013! Ein rauschendes 2013!